Austria lies at the heart of Europe and is dominated by the Alps which lie in the west of the country. It was once one of the greatest empires in the history of Europe, but is now a small federal republic. The country was created in 1920 after the collapse of the Hapsburg empire but became part of Hitler's Germany in 1938. It regained independence in 1955 after the departure of the last Soviet troops from the Allied Occupation Force. Austria has a successful high-tech industry, a strong agricultural base, and enjoys tourists from the wealthier end of the market. Austria has warm, humid summers and bitingly cold winters with temperatures frequently dropping below freezing. In the remote valleys winter snow may remain well into the Spring, while higher mountains remain snow-covered throughout the year. Not surprisingly, therefore, the country is noted for its skiing. Austria is a country with a 'look' of its own. The image I carry with me is of flat green valleys, open grass right up to chalet boundaries - or even the buildings themselves - hardly any fences, hardly any livestock (they all seem to be in barns), and everything neat, clean, and tidy as a new pin. I think it might be a hanging offence to drop litter, so take care (quite right too). It is a beautiful country, but not as dramatic as Switzerland: where the mountains are much higher and more dramatic. So, if you've yet to visit either of these countries, I would advise going to Austria first; I did the reverse, and the 'lower' mountains were a disappointment after the drama of the Swiss Alps. I find the people friendly enough - more so than the Swiss, who don't seem to have figured out the purpose of humour yet. So for people, I vote Austria; for scenery, however, I vote Switzerland. 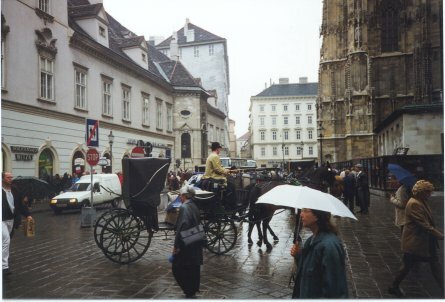 Austria's capital city, Vienna, is one of the oldest settlements of the European capital cities. The Celts lived here for centuries before the birth of Christ, and it was in the year 1 AD that the Romans established the fortifications known as 'Vindobona'. 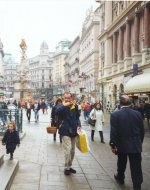 Vienna has had a colourful history, with different phases of expansion/contraction, including significant expansion during the 14th century when its population rose to around 40,000. But it was after the ancient city walls were razed in 1857 that numerous representative buildings were built along the almost 200-foot (60-metre) wide 'ring'. I'm not one to use fanciful terms, but I do regard this as the 'magic ring' of Vienna. I suggest that you see it all at a relaxing pace by taking one of the trams that perambulate around it all day long. Like most cities, there are regions in the outskirts which do not delight the eye, but once you get within the magic ring, all is guaranteed to be different: impressive, grand, elegant, inspiring - expensive, even. 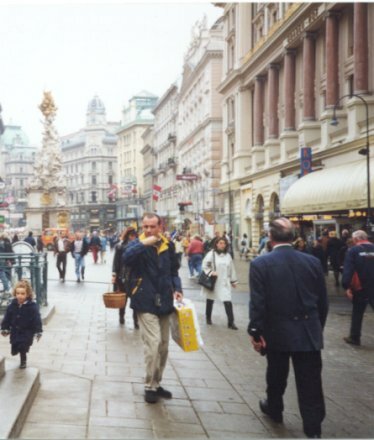 Vienna is a place of indulgence, of visiting museums, attending the opera, listening to music, sipping dark (small) cups of coffee in coffee houses, admiring the architecture, and watching your wallet diminish. As for the 'ring', it is actually far from 'round': it's more like a hexagon, it's different sides having different names, with one side pressed concave by the contours of the River Danube. Unlike most cities that lie on the Danube, Vienna is far from dominated by it: in fact, you hardly notice it, there is so much else to see! 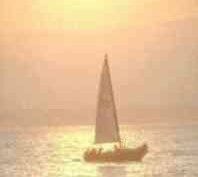 So much so, that trying to see it all will keep you in a Vienese whirl no matter whether your time there is long or short. Certainly, you can get a good 'flavour' of the city in a few hours, but to get to know it better, you need a few days. And if you're into museums, you need a few weeks! Wandering round the ring itself is an eye-opener: for it takes time to believe what you are seeing! Could so much grandeur have no end? The centre of the city is contained within the ring, with St. Stephen's Cathedral dominating the central square. This famous cathedral is Austria's most important example of Gothic architecture. Its central location, and the fact that walking out from it in any direction eventually leads you to the ring, means that while you may not always know where you are, you never need get 'lost' if you stay inside the ring. All around the ring are the most fabulous buildings, including many museums; if you love museums, then visit Vienna and you'll think you've gone to heaven (although the strains on your wallet will soon bring you back to earth). We had coffee in one of the famous coffee houses. They go in for the small-cupped, wickedly strong brew here, traditionally served with a small glass of water. I guess this is to wash the taste away afterwards! Opulent surroundings with your coffee is a must - at least once - but this does not come cheaply. And don't expect the waiters to pander to you; after all, they do work there, and you are merely a customer - worse, merely a visitor - so wait patiently until they feel it's right to attend you. Beware of their game of appearing to come to attend to you when they're really attending an empty table; box clever and play them at their own game; so leave enough time for this little party game. It must be hard for them to accept a tip, but somehow they survive the ordeal; but know that you've really made it if your tip can impress them! What's to see? Too much to tell - so I'll just say that it rained while we were there; you know my luck! Here's a mere taster! The baroque Plague Column on Grabel was built in fulfillment of an oath made by Emperor Leopold I during the Plague epidemic in 1679. Then there is the huge State Opera House, the Albertina (housing the world's largest collection of graphic arts), the Museum of Natural History, the Museum of Fine Arts, the Hofburg (former Imperial Palace which, it is recommended, you should spend a few days over), the Palace Chapel (great to catch the Vienna Boys' Choir here), and much more. Outside the ring is the amazing Giant Ferris Wheel in Prater Park. It was built in 1896, but don't worry about the bolts: unlike fairground rides, they've had time to rust rigidly together. It looks as if a collection of building-site huts have been strung onto some revolving scaffolding, but this is Vienna's second famous landmark - after St. Stephen's Cathedral. The original carriages were burned during the war, so perhaps this is what they replaced them with during the rebuilding of war damage. If you enjoyed reading the above article then you will probably also enjoy Lake Garda by Ed, and Oslo, also in Europe, and our latest articles covering the Orinoco Delta, La Mata, Marbella and Beijing.